This site is for active and independent travelers rather than tourists. When you travel you encounter the unexpected. A traveler might get lost. But in getting lost you find new experiences. We share what we learn and tell our story with pictures while providing a historical context. We hope you enjoy our blog describing the beauty and experiences of our travels. Click the destinations below to learn more of both history and travel. 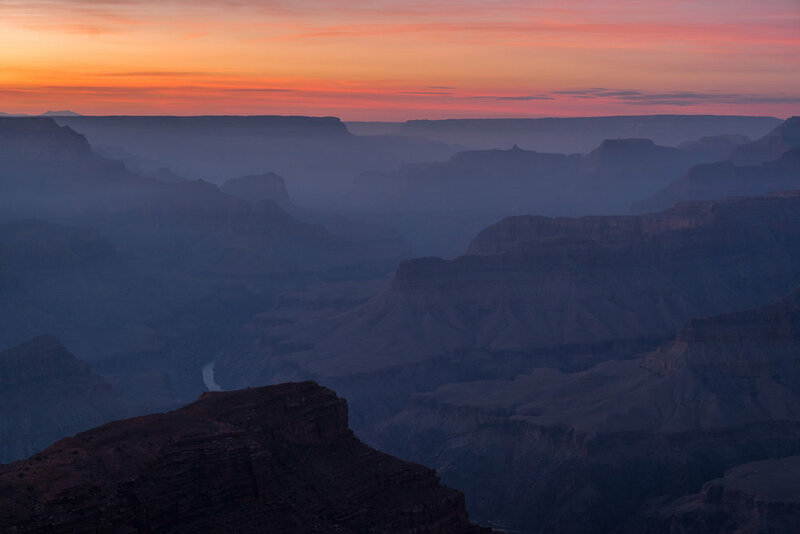 "The Grand Canyon is so perfectly named, and yet so widely and commonly known that we frequently pronounce the words without the emphasis that the reality of the canyon deserves. To see it in person, however, still takes the breath away. To become immersed in it - over the edge on a back-country trail, tossed in a raft by a Colorado River rapid, or silently counting down the terraces of geologic time while watching the sun set from our own private pinnacle along the rim - is to realize what a wonder we are privileged to behold" wrote Albert Atchison in A Wilderness Called Grand Canyon. 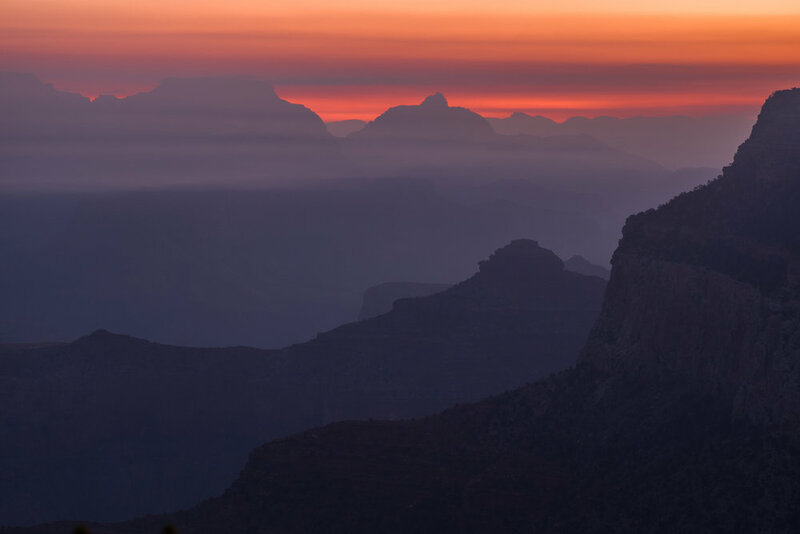 According to the National Park Service (NPS), the park hosts about 6 million visitors per year - 2% descend the rim for 15 minutes or less and less than 1% visit the canyon floor a mile below the rim. The Grand Canyon is a time machine. For six million years the Colorado River cut through the earth exposing layer after layer of ancient stone. The river divides the park into the North Rim (closed in winter) and South Rim (open year round) which overlook the 10 mile/ 16km wide canyon. The buttes, spires, mesas and temples in the canyon are in fact mountains looked down upon from the rims. When you peer over the edge for the first time you create a permanent memory. Nothing you have experienced in life prepares you for this initial view. The Grand Canyon is simply enormous. The river below carved a wound in the earth's surface 277 miles long, 10 miles wide and one mile deep. The river exposes mountains and mesas hidden under the earth, just as Michelangelo exposed David hidden in solid marble. Everything here is big - the rim, vistas, horizon, mesas, history, explanations, treks, emotions, imagination, fears, dreams and even your appetite if you make it down and up. It is a privilege to visit the Grand Canyon. Looking down fills you with wonder. How did this happen? How old is it? 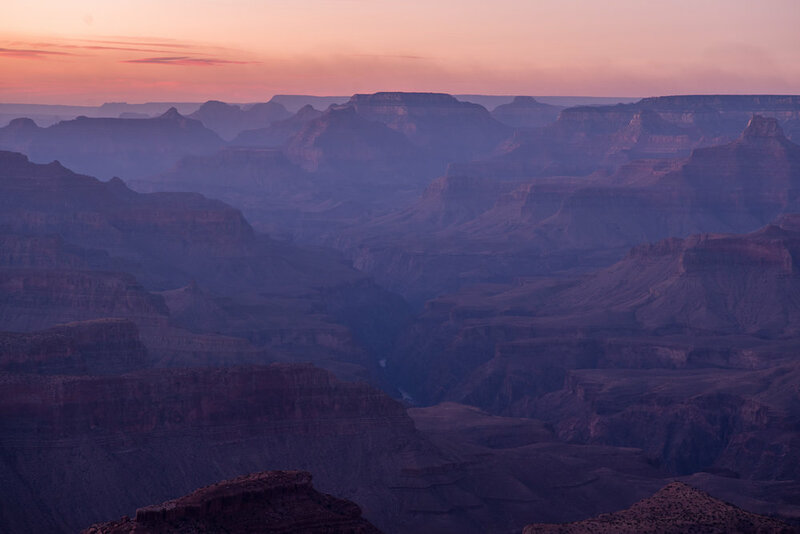 A visit to the Geology Museum of the Grand Canyon can answer some of these questions. Watch Ranger Clint from the geology museum explain the magic of the area. Wonder what it is like to be on the bottom and look up? We will do our best to tell you. Around the middle of December we decided to head to the Grand Canyon. Chief district ranger John Evans says, “You’ll more or less have the place to yourself.” Not quite, however, last minute lodging is available in the park as well as in Tusayan, the small town directly outside of the South Rim entrance. We are GC newbies - other than a bite size, looky-loo 4 hour visit 25 years ago. We had low expectations other than the adventure would be grand! But my secret heart's desire was to descend to the desert oasis at the bottom and stay at the legendary Phantom Ranch. 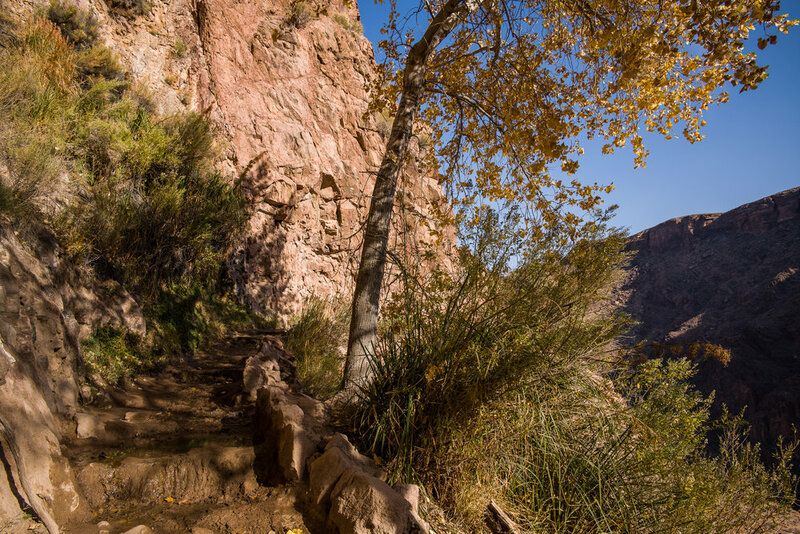 If you are in decent physical condition, a pilgrimage to Phantom Ranch is a bucket worthy experience. Early Phantom visitors emphasized that having a "sturdy and adventurous" constitution is necessary to make it from top to bottom to top. And don't expect 5 star accommodations. There is everything you need - hot water, hot food, fresh water and a bed with a pillow, sheets and blanket. It is important to remember that "sturdy and adventurous" applies to your time below as well as the journey down and up. All provisions (except water which is piped in) are supplied by the mule trains each and every day. 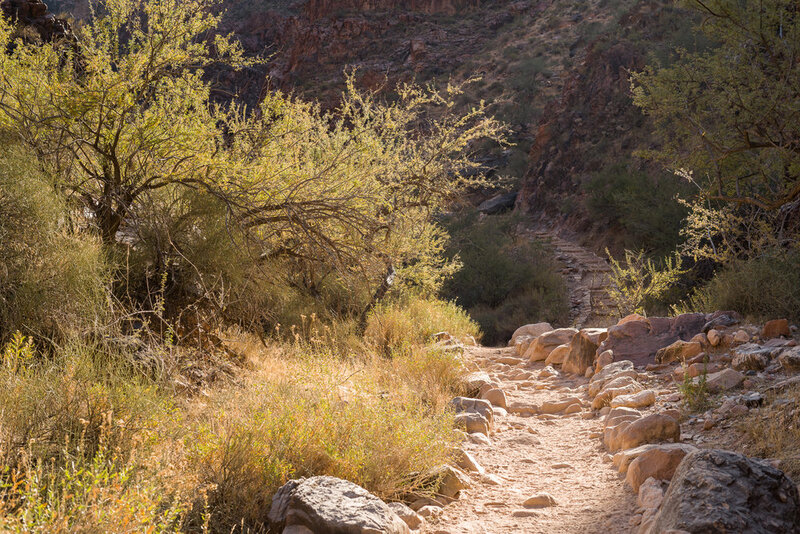 Surely, hiking gear has improved since those first brave souls descended but once you begin your pilgramage, you understand getting to Phantom Ranch requires digging deep to find your reservoir of effort and grit, similar to the pioneers. We'd heard that a Ranch stay is complicated and requires committing to a specific date, almost a year in advance. All true and not our style. We decided to research if securing a slot due to a 24 hour cancelation is possible. 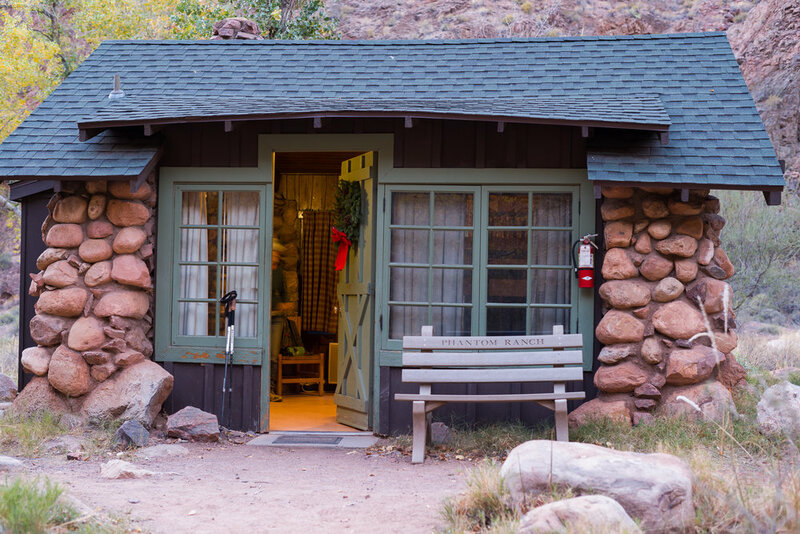 There are 2 ways to overnight in the canyon - tent camping (find info on the perfect tent from Sport Fitness Advisor) and reserving space in a Phantom Ranch cabin or dorm. Campers obtain "same day" permits at the Back Country Office at 8am (best to get there a little early). Those wanting a real bed can book a last minute Ranch reservation at the desk located in the Bright Angel Lodge at 7:45 am. With fingers crossed we checked and scored a cabin for 1 night! Be sure to book breakfast and dinner when you make your reservation regardless if it is 1 year in advance. And yes, campers may also dine at Phantom Ranch but they MUST have a reservation. After hiking for 8 hours, the hot dinner will fill your belly and soul. Next morning's hearty breakfast of eggs, bacon and pancakes will provide fuel for the day ahead. With our reservation secured we were giddy with excitement and needed to hustle. Our belongings were still at the Grand Hotel just outside the park. So we drove to Tusayan, checked out, got our belongings, packed for the hike, got some breakfast, snacks and water for the day and drove to the parking lot next to Bright Angel Lodge to start our hike. We finally began our descent around 11:00 AM. 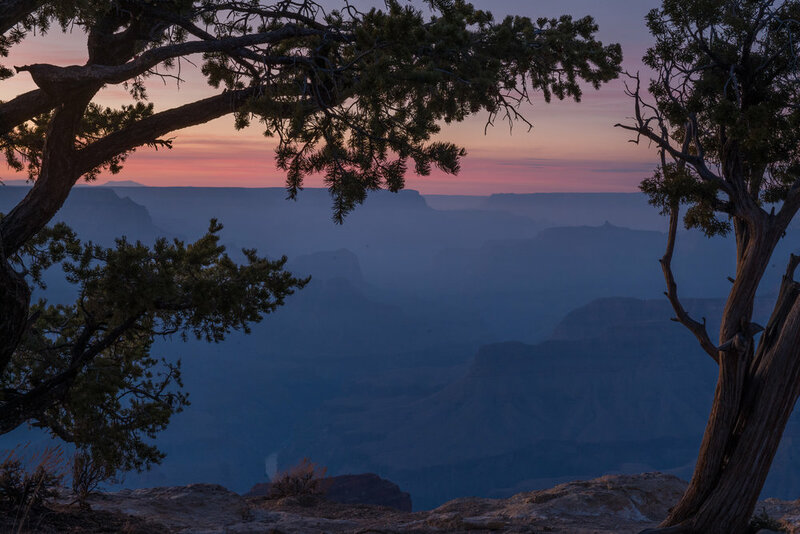 TIP - The Kaibab Trail is a few miles from Bright Angel Lodge and there is a free hiker express shuttle that goes directly to the trail head in the morning. If you miss this shuttle (like we did) spend $10.00 to take a taxi to the trail head. If you take the regular free multi-stop shuttle, you forfeit an hour of precious day light. We could not afford to do this. The desk at Bright Angel will order a taxi for you. Bring cash. There are 2 trails from the South Rim to the bottom. 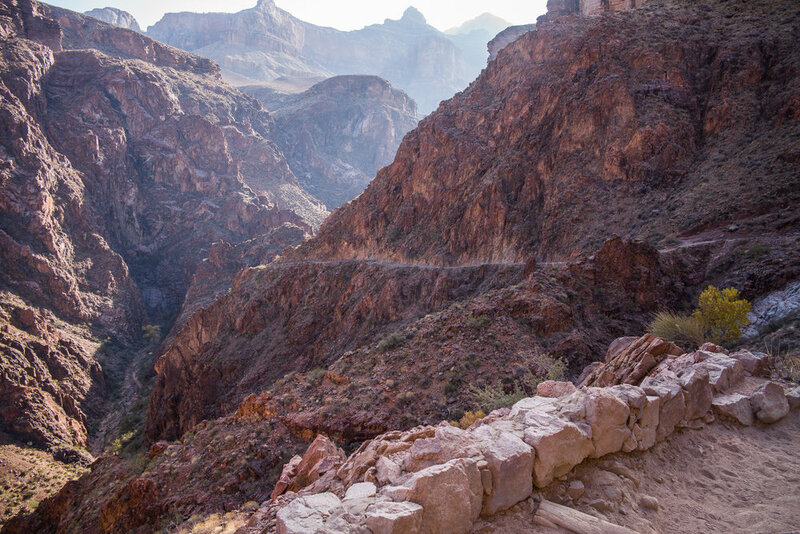 The recommended route is to descend the South Kaibab trail and to ascend the Bright Angel trail. South Kaibab is shorter (only 8 miles) and a little steeper. Every ranger and canyon veteran we spoke with shared that the way down is easier than the way up. You need to be self aware and self reliant as there are plenty of opportunities to twist an ankle if your mind wanders. No one is going to hold your hand or get you a drink of water on the Kaibab because no water is available until you reach the canyon floor. General rule is carry about a gallon per person for the hike down. It is usually warmer at the base so if you go in the summer bring more water. The Kaibab snakes down the ridgeline with expansive, breathtaking views. As you descend, you gradually begin to get a sense of the massive abyss. The canyon layers are like a time machine with each stone layer older than the one above it and you notice the rocks change color and structure. When you finally reach your destination, you are surrounded by some of the oldest visible rocks on earth dating back almost 2 billion years. After one mile on the trail, we reached the aptly named Ooh-Aah Point and realized our journey had barely begun. We had to get to the bottom before daylight turned to dusk. Fortunately, the lower half of Kaibab is not as steep as the top so we picked up our pace. Continuing our hike down into the canyon, the views tranform. There were thousand foot cliffs above us and below us. Inside this chasm is sky. If you are fortunate you will see eagles and condors fly by as you continue to descend. Time stops inside the Canyon. Phantom Ranch exists much like it did 90 years ago without many modern machines, internet or cellphones. Muscle and will provide the food and drinks you enjoy. Expert wranglers lead sure footed, steady mule trains that transport supplies and pack out trash. Hearty souls work at the Ranch cooking meals and cleaning the cabins. Life is simple at the Ranch. You check in and enjoy a cold drink at the Canteen. Take off your boots and give your feet a well earned massage. Cabins have bunk beds, a sink and a toilet. Showers are in the Bath House. There are also 2 dorms for men and women. Each have bunk beds for 10 as well as a toilet and shower. We stayed 2 nights - one in a cabin and one in the dorms. Both were comfortable though we traded privacy for community when we moved to the dorm. Tip - Bring earplugs just in case you end up in the dorm and you are a light sleeper. In the late afternoon, enjoy a ranger talk until you hear the sound of the dinner bell. There are 2 dinner seatings at 5 and 6:30. From At 8 pm, the mess hall re-opens for board games and socializing. Phantom Ranch t-shirts and hats are only sold here. Mail a postcard postmarked at the Ranch and stamped "delivered by mule." Around 10, the mess hall closes and it is time marvel at the star filled night sky and a well deserved sleep. Tip - Bring a headlamp or flashlight to illuminate your way back to your bunk. Phantom Ranch stamps mail "delivered by mule." If you are lucky and spend 2 nights at the base, there are 3 great day hikes to consider. Leaving from the Phantom Ranch/Bright Angel Campground area are the River Loop (1.5 miles), Clear Creek Trail (9 miles each way) with plenty of scenic stops along the way and the hike to Ribbon Falls (13 miles round trip). Or perhaps you lounge at "the beach," a sandy area right next to the Black Bridge. 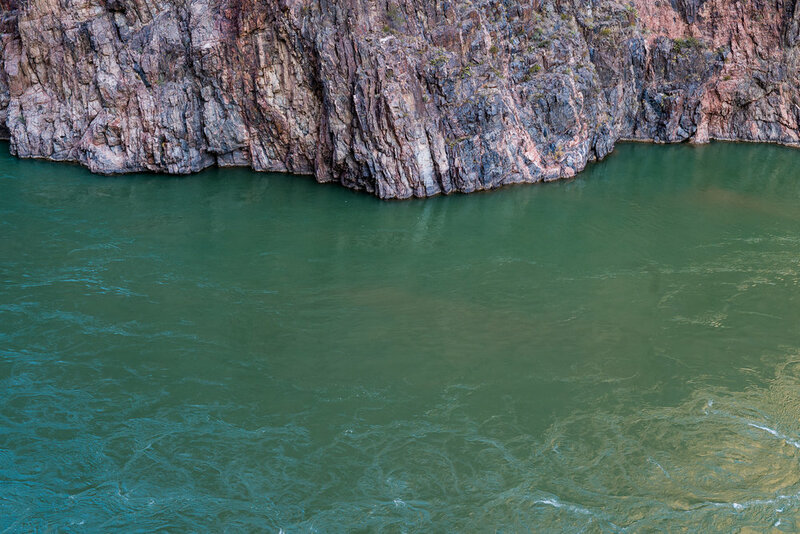 The swirling peridot colored water of the Colorado River is captivating. After 3 days and 2 nights at Phantom Ranch we began to feel the healthy effects of digital detox. In our modern connected world there is an "always on" sensation. Technology companies hire armies of geniuses to try and capture your time, your attention and your life. In "How Technology is Highjacking Your Mind," Tristan Harris explains that FOMSI - Fear Of Missing Something Important is a technology hijack strategy. This played out before our eyes as a fellow camper asked the Ranger if she had internet. The desperate camper believed that "something important" happened a mile above us and needed to know what it was. Clearly she had not been at the Ranch long enough to relearn what is really important. Our digital detox experience was so powerful we now have internet-free days upon returning to the earth's surface. On Day 3, we departed shortly after breakfast, headed past the Cottonwood grove and walked toward the Bright Angel Trail with plenty of daylight for the 13 mile trek. Crossing the Silver Bridge, we turned around for one last glimpse of the glorious desert sanctuary. 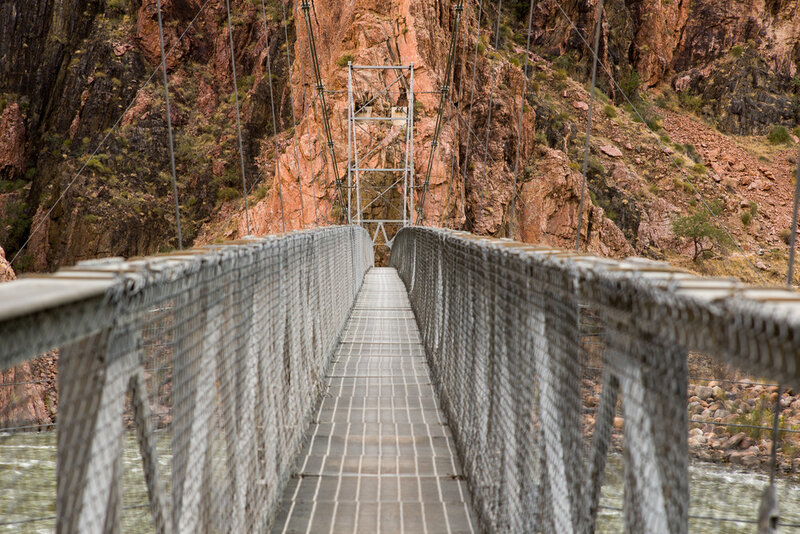 The pipeline carrying water to Canyon Village on the south rim is visible beneath your feet as you cross the Silver Bridge and head toward the Bright Angel trail. Seeing this small pipeline which provides water to 6 million visitors illuminates the fragility of the canyon and the importance of water. (You can read more about water later in this post. 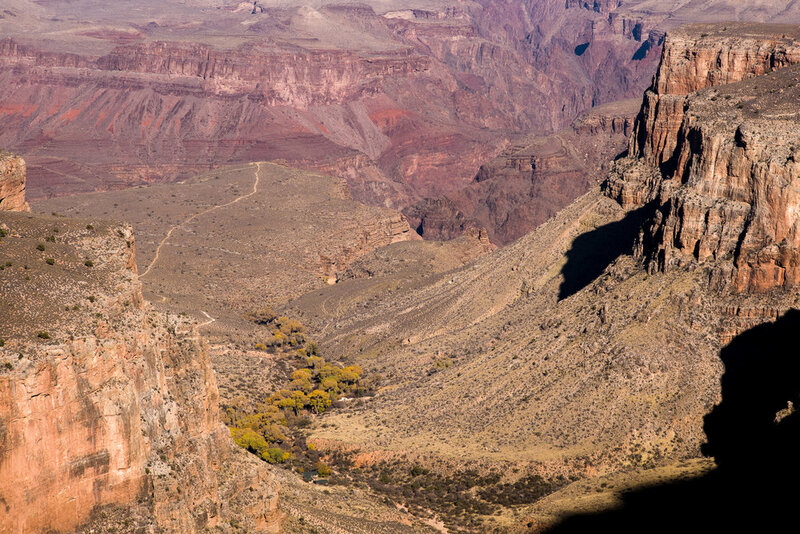 )Bright Angel trail offers different views than the Kaibab. The first mile snakes along the Colorado before heading up the the canyon walls at the River Resthouse. Hikers enjoy gurgling streams, small waterfalls and the pleasant sound of water moving over rock. The trail goes up the same wash as the creek comes down. You might hop from rock to rock in order to cross small streams as the trek continues. 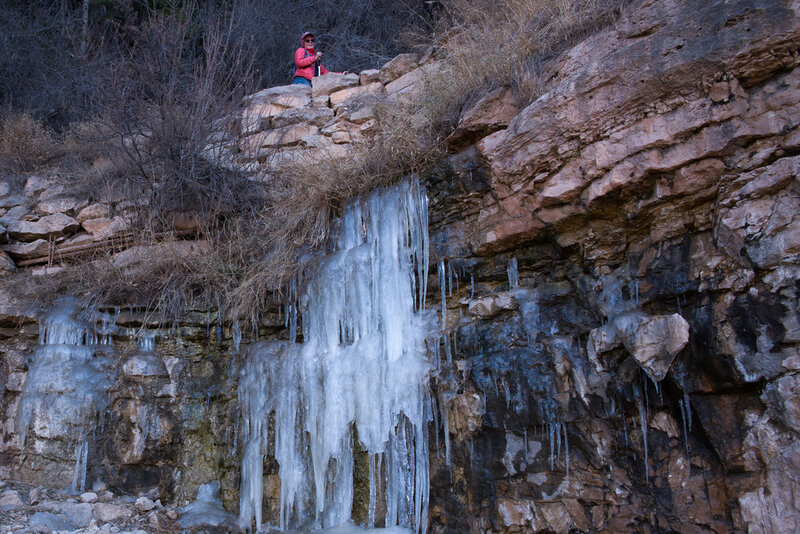 While the Kaibab trail follows ridge lines, Bright Angel follows rivers, creeks, and canyons. Kaibab is in the sun and Bright Angel is in the shade. And unlike Kaibab, this trail offers 1 place to refill your water at Indian Garden which is also a campground and popular day hike destination. Leaving Indian Garden means only 7 miles remain! Looking up, it's impossible to decipher how you will get to the top which is still 3000 feet above you. And looking down 2000 feet, the trail is obscured. Hours pass. The mental odometer ticks off the miles. Birds soar on the thermals in the underground sky. The trail criss-crosses streams. Vegetation in the creek is vibrant and brightly colored. Peace and quiet fill the canyon. Every so often you hear the comforting sound of hooves on the trail so you know you aren't alone. As you near the rim, there is a cold beverage waiting for you and it is literally a few steps away at the Bright Angel Lodge Bar. The Bright Angel Lodge is an excellent place to stay if you want to explore the rim. 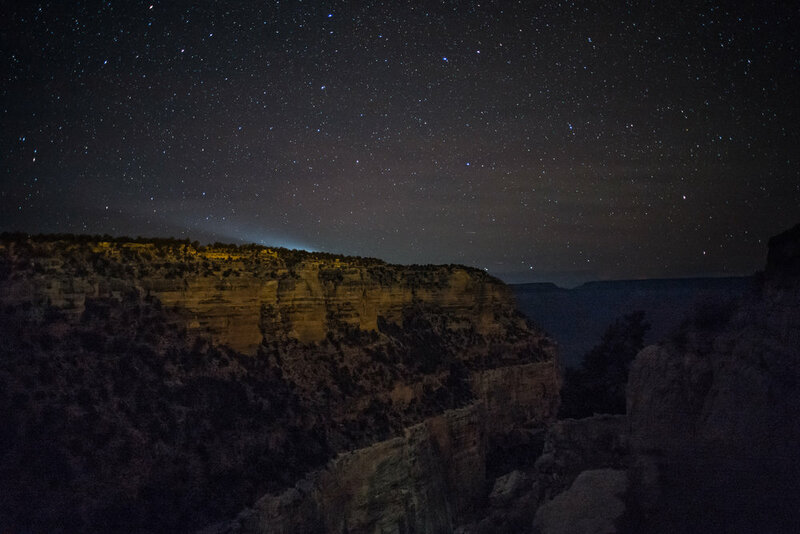 The Lodge is literally steps from the Bright Angel Trail. 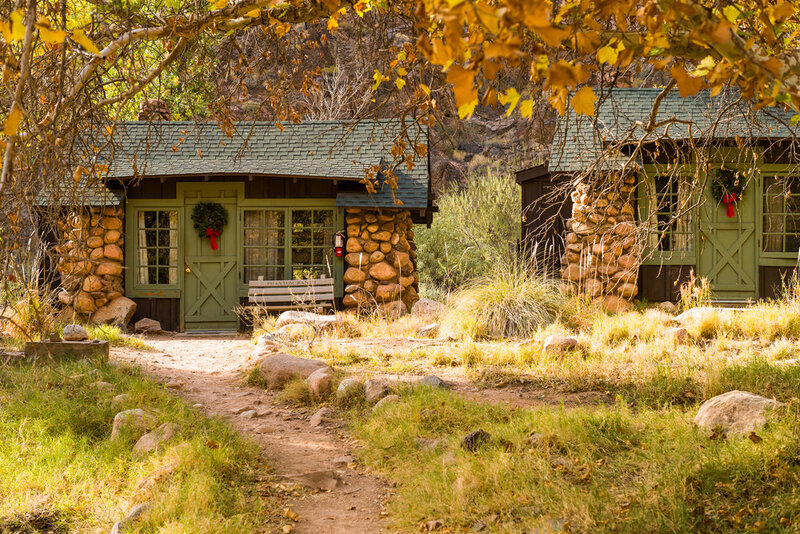 Cozy cabins (designed by Mary Coulter in the original style of Buckey O'Neill's cabin built here in the 1890's) are a short walk to the rim. Enjoy a nice meal in the Bright Angel Lodge or walk a quarter mile along the rim and dine at the El Tovar Hotel. If you find National Park Hotels of interest, El Tovar will not disappoint. Dinners are pricey and require a reservation. Breakfast is reasonably priced and the food and service are exceptional. Next to the Lodge is the Kolb Photography Studio which opened in 1905. The Kolb brothers used glass plates with silver emulsion to produce their work. Developing these glass plates required lots of water. At that time, water at the South rim was scarce so the brothers took their plates 4.5 miles down the trail to Indian Garden in order to develop them. 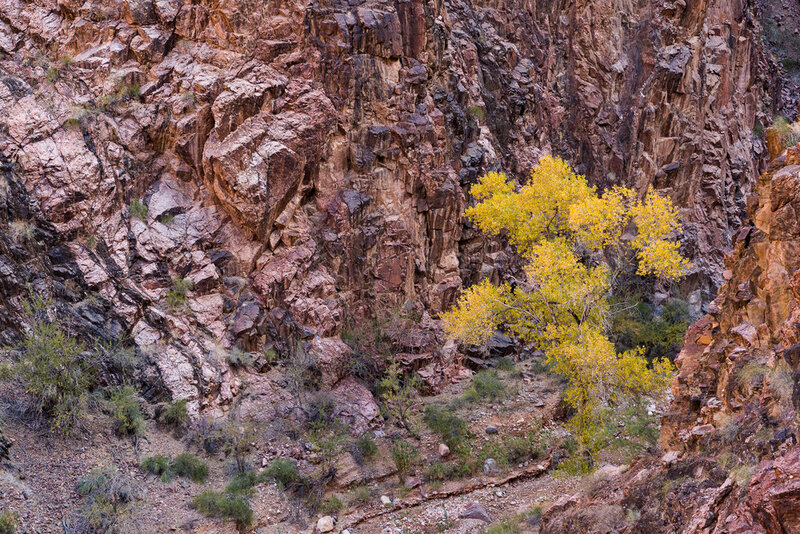 There are great canyon views from the studio and photographers will find their story fascinating. You can walk, take shuttles or ride bikes along the Rim Trail which has breath taking views. Enjoy the morning sunrise. Sunsets are filled with color and the night sky with stars. Here are some views from the rim. The first human residents were likely the Anazasi Indians. Remains of a 1000 year old pueblo are visible at the Bright Angel Creek/Colorado River juncture. In addition, Havasupai, Zuni, Hopi and Navajo congregated in the canyon for refuge as well as sacred ceremonial gatherings. In 1869 American legend, soldier, geolgist, explorer, and professor, John Wesley Powell led the first "known passage by persons of European descent through the Grand Canyon" and then floated down the Colorado. His team camped next to the ancient Anazasi structure. From 1902 -1948 Mary Elizabeth Jane Colter, an industrious architect, designed 8 park buildings which are still standing. Her work includes Phantom Ranch, Bright Angel Lodge, Hopi House, Hermit's Rest, Lookout Studio and The Watchtower. Originally hired as an interior designer for the El Tovar Hotel, she quickly made her mark as chief architect. In Phantom Ranch, Scott Thybony writes, "Colter designed buildings that drew upon the region's cultural traditions. She borrows what worked aesthetically from Spanish influences, Pueble Indians, even miners and cattlemen. The cabins were wood-frame structures and furnishings were kept simple." It turns out that even though the Colorado River flows through the Grand Canyon none of the river water can be used by the park. Water Rights for the Colorado River were settled in an interstate treaty in 1922 named the Colorado River Compact. 7 states signed the treaty but the National Park and Native Americans were not signatories. This complicated and important matter of Water Rights of the Colorado River are still being argued today. This issue makes no sense to a casual observer. How can Native Americans be denied water rights? How can the National Park be denied water rights even though the Colorado flows right through the park? Because of this treaty park water must come from somewhere else. In the early days the Santa Fe Railway supplied the Grand Canyon with water in tanker cars. This ended with the building of the Trans-Canyon Pipeline in 1965. ALL the water to supply the park comes from Roaring Spring on the North Rim. The Trans-Canyon Pipeline uses gravity to supply water to Phantom Ranch and to Indian Garden half way up the Bright Angel trail. There is a pump house at Indian Garden which pumps water to the South Canyon Rim. You can read about this monumental engineering project here. 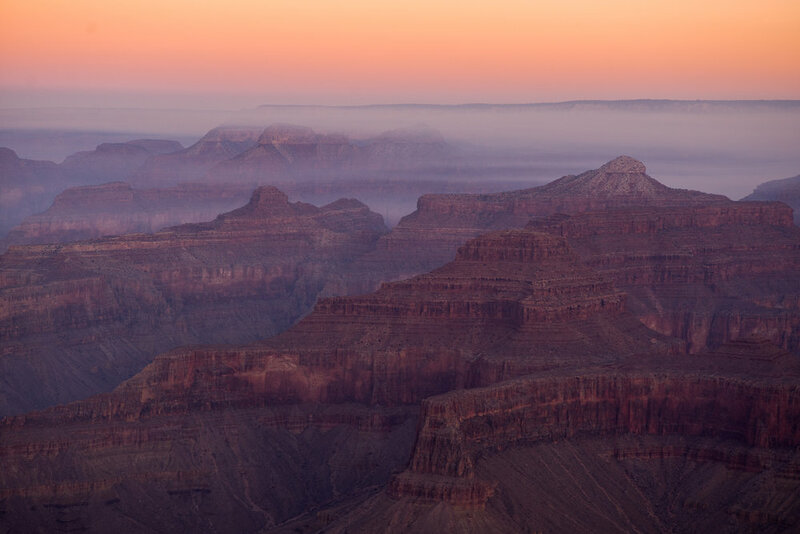 If a visit to the Grand Canyon is on your list, please check out the National Park Service FAQs to get started. Some people hike down and up in a day. However, the Park Service offers this warning: Hiking to the river and back in one day is not recommended due to long distance, extreme temperature changes and an approximately 5,000- foot (1,500 m) elevation change each way. 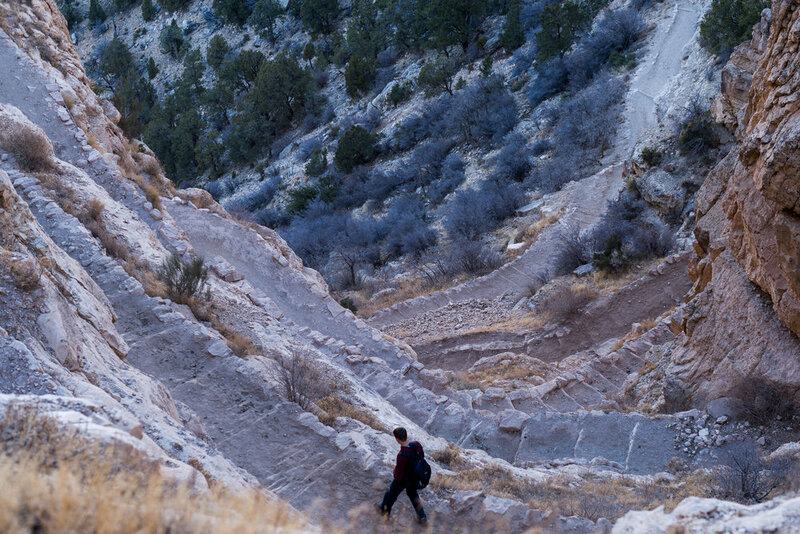 If you think you have the fitness and expertise to attempt this extremely strenuous hike, please seek the advice of a park ranger at the Backcountry Information Center. Know how to rescue yourself. YOU are responsible for your safety and the safety of your family and friends. Rescue is not guaranteed and assistance may take hours or days due to weather or other emergencies. If you decide to hike to the river, please review your plans with a ranger prior to departure. Also, if you make the journey a sprint, you won't have time to savor the experience. Take the time to visit and reward yourself with the luxury of stopping along the way to soak in other worldly views. Here are some of our favorites in the gallery. Find a bit of shade and listen to absolutely nothing for a few minutes. Marvel at the saddle bag packed mules ambling along with their awkward gait. For a split second, you imagine they will walk over the edge! But at each turn, their nimble hooves shift at just the right moment and they continue. Happy trails.